It has a special shelf for a solar heated water bag. A solar shower bag isn't included, and you should get it additionally (2 or 3-gallon capacity max). 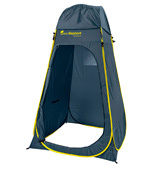 Lightspeed Outdoors offers you a feature-rich tent that can find many uses at a campsite. It's a great enclosure for long camping adventures. 61" x 61" x 80.7"
For neat organization, it has 1 pocket with 2 compartments outside and 1 pocket with 4 compartments inside. The setup instructions are not very helpful. 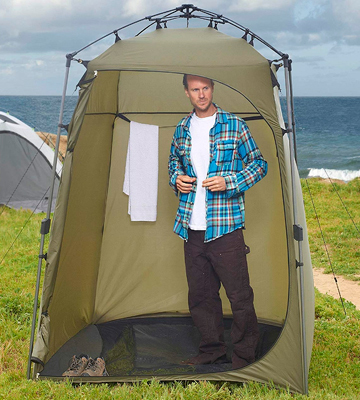 The KingCamp shower tent is perfect for large campers and those who don't like close places. You will be able to stand, bend over, and still never touch its walls. 65.7" x 65.7" x 85.8"
Made from premium 190T Oxford fabric with silver coating, it provides all-day UV protection and keep you cool during hot summer days. You'll need to bend over to get inside. 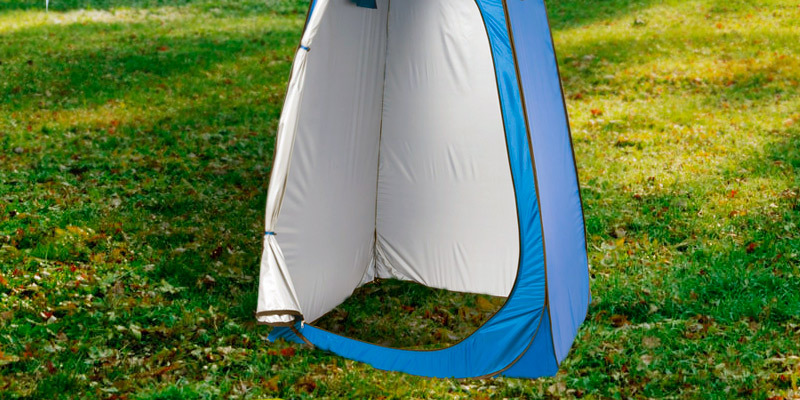 This mini pop-up tent won't add much weight to your camping gear but will provide you with some privacy outdoors. Excellent for those who travel light. 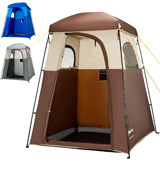 47.2" x 47.2" x 74.8"
This multipurpose pop-up tent is packed with multiple accessories for your convenience. A lantern hook and a special hanger for toilet paper are particularly handy. Some users dislike a no-floor design. 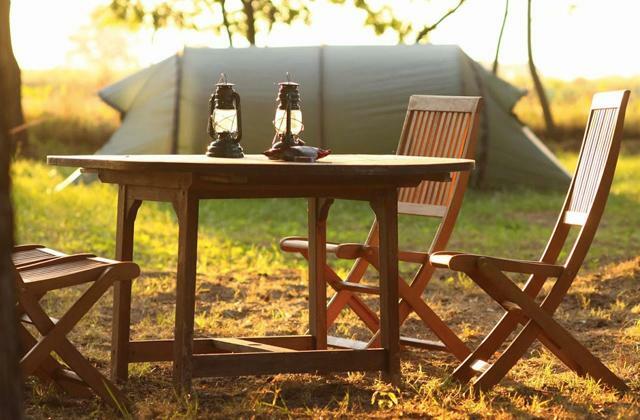 The Green Elephant Pop Up Utilitent tent is a fantastic solution for all your travel needs. With this premium product, you can go anywhere and anytime. 47" x 47" x 82.7"
This shelter comes in various color options, so you're likely to find the matching one for your camping gear. The roof doesn't have netting. This is a nice tent to have in your household. It won't cost you a fortune nor will it take much storage space, but it will come in handy on many occasions. 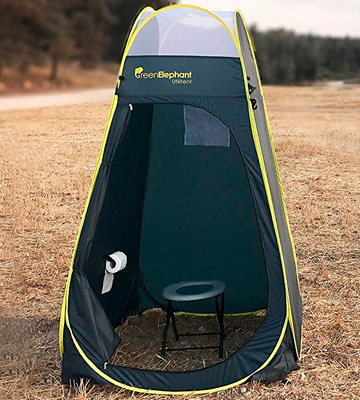 48" x 48" x 78"
The Lightspeed Outdoors portable privacy tent is an absolute winner for us because of two things - it's extremely easy to set up and every detail here is thoughtful to bring you ultimate comfort outdoors. 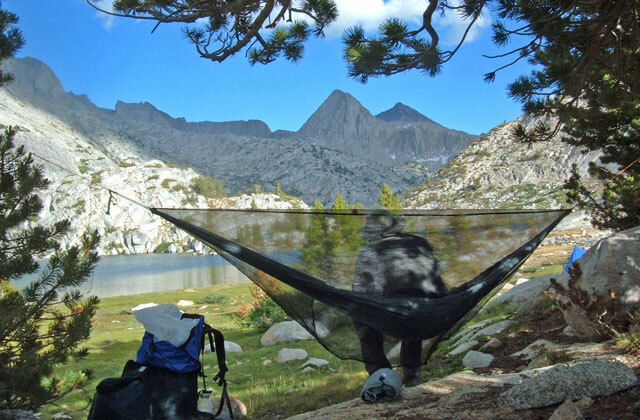 Probably, it's the fastest tent to pitch up and store back in the bag. The trick is that the poles stay connected to the tent and fold up together with it. No separate tent poles to assemble means less time for setup. To be more precise, the privacy tent is claimed to set up and break down in less than 1 minute. As for the extras, this is the area where the Lightspeed Outdoors enclosure really shines. It has numerous extra frills that makes it the perfect outdoor combo shower, toilet, and changing area. Inside this roomy tent, you'll find a long strap for towels or clothes, two large mesh pockets for amenities and, most importantly, a shelf for a solar heated water bag. Though take note that a solar shower bag isn't included, and you should get it additionally (2 or 3-gallon capacity maximum) if you intend to use the shelter for showering. 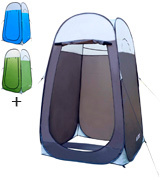 To let the hot shower steam out, the tent is equipped with two zippered mesh "skylights" that allow air in and out. Another perk is the zip-away floor that can be clipped up or down for your needs. As you see, the tent is stuffed with numerous nifty features that can make your outdoor experience far more comfortable. However, the trade-off for those bells and whistles is the relatively heavy weight of 16 lbs. So, bear that in mind when making your choice. To sum up, we're not easily impressed, but this one has completely sold us. 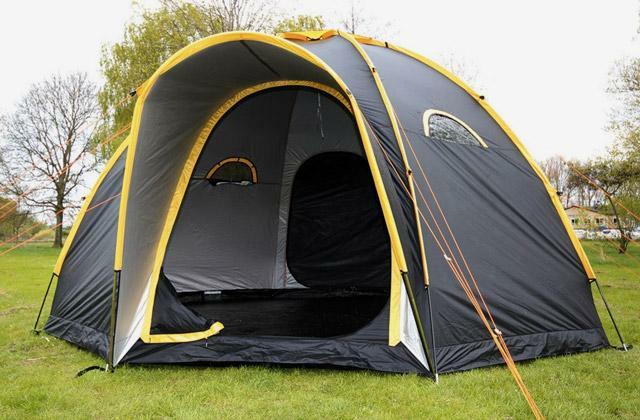 It's a feature-rich tent that can find many uses on a campsite. It's the stellar enclosure that is perfect for long adventures. Looking for an extra-roomy shower privacy shelter? 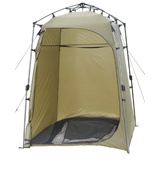 The KingCamp tent is what you need. It's by far one of the largest models we've seen so far. Being 85 x 66 x 66 inches, it's extremely wide and tall for anyone to comfortably shower and dress inside. It's much more spacious than regular-sized ones, so you'll be able to shower without touching the sides. The manufacturer says that even two people will have plenty of space and won't feel cramped, and we would agree with that. Naturally, the large tent like this requires some time and effort for assembly, and unluckily the instructions are a little sparse and not very helpful. So, if you have zero experience in setting up similar tents, you might need to turn to pro campers or YouTube videos at least. Once assembled, it's very stable owing to high-quality fiberglass poles, ropes, and pegs. 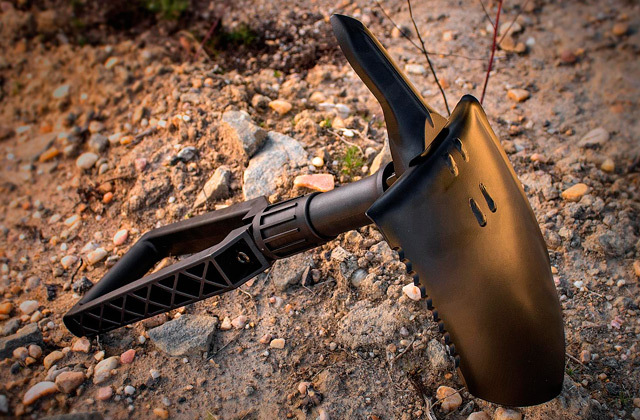 You may rest assured knowing that it can stand up to the weather very well. Wind and heavy rains are no problem for this strong enclosure. At the bottom, there is the polyester floor that is fairly sturdy and has mesh all around to drain the water and keep out debris. To round things up, the KingCamp tent is a perfect model for large campers and those who don't like close places. 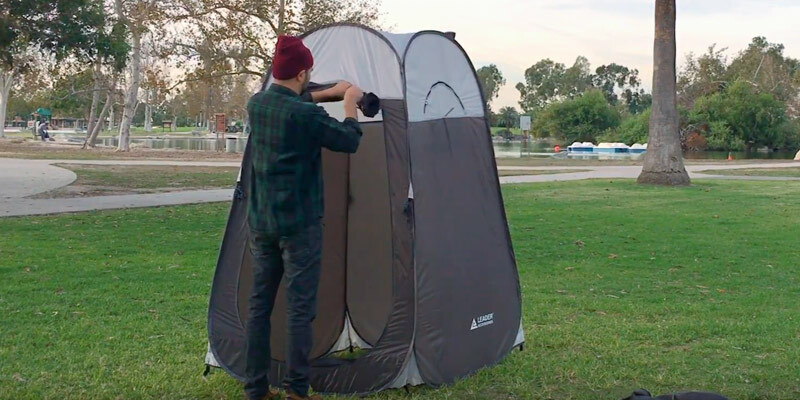 With this one, you will be able to stand, bend over, and still never touch walls of this tent. 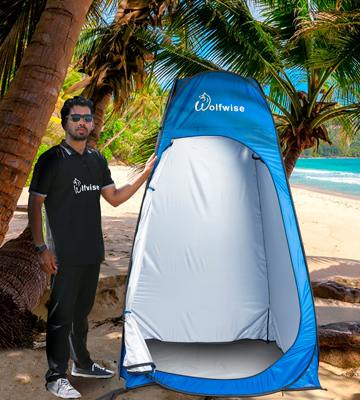 If you need an inexpensive addition to your camping gear to use as a sheltered toilet, shower, or changing area, take a closer look at the WolfWise Pop-up Shower Tent. 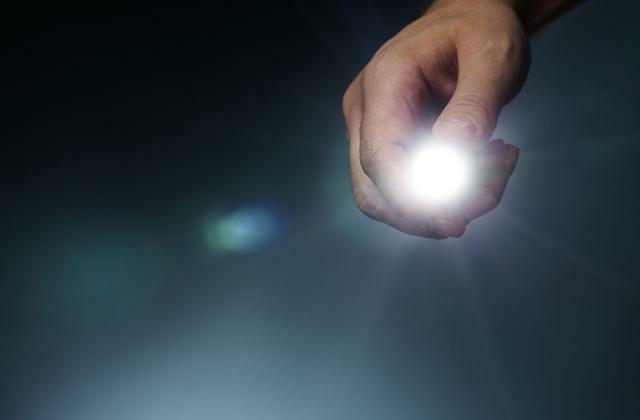 It's a great product that functions even better than expected. Coming at less than $40, the tent is manufactured from premium 190T Oxford fabric with silver coating for amazing performance. 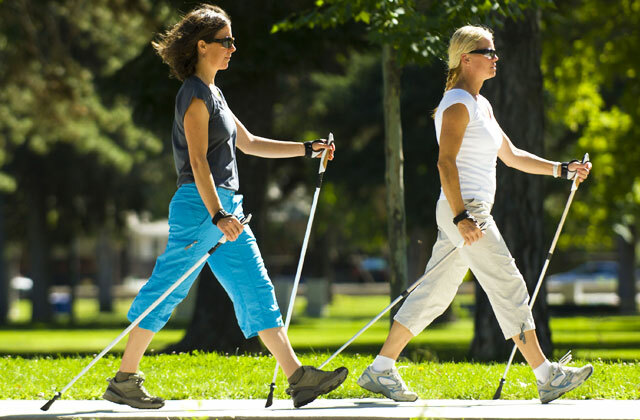 The waterproof polyester fabric with taped seams provides all-day UV protection (UPF up to 50), while the inner silver coated surface absorbs sunlight to keep you cool during hot summer days. But the best part is that the material gives you extra privacy on super sunny days. Unlike most other tents in its price range, you won't be able to see through it, which is especially useful if you're going to use it on country music festivals, picnics, or other overcrowded events. Compared to the previous model with wind-rope design, this one has a thick steel frame and 4 fitted sandbags with attached wind ropes for increased stability. 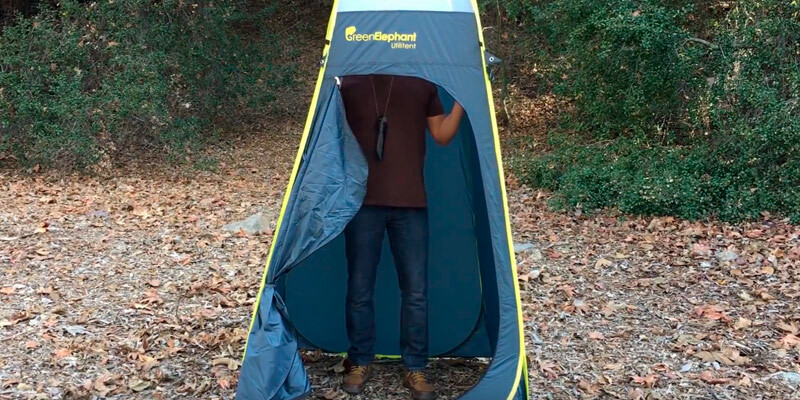 This design also makes it easier to install - it sets up in a matter of seconds and is easy to get back in the bag, which is not typical of most other pop-up tents. The carry bag is also included in the set. 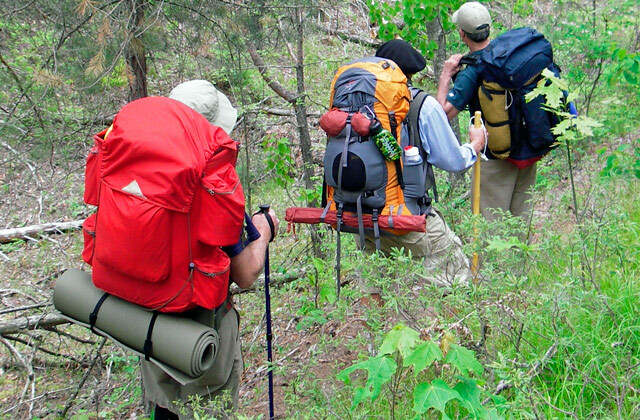 It has handy straps allowing you to carry the folded tent like a backpack. Being just 3.3 lbs, the tent is not heavy to carry either. The only thing we dislike about its design is that the doorway is rather low, and if you're taller than average, you'll need to bend over to get inside. Yet, the tent itself is high enough to stand in. 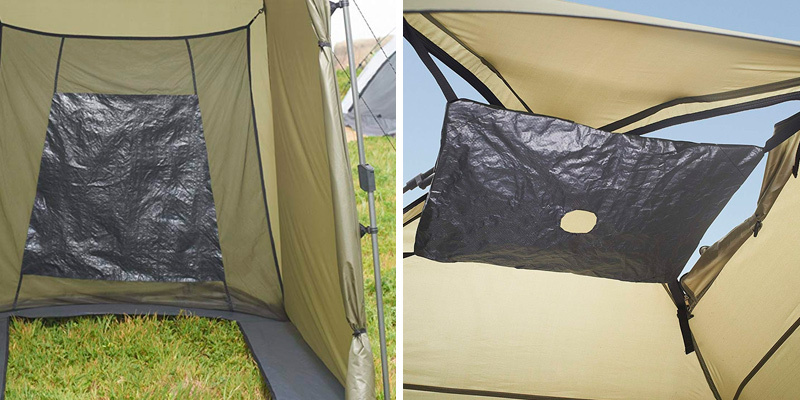 All in all, this mini pop-up tent is a neat little thing that won't add much weight to your camping gear but will provide you with some privacy outdoors. Excellent for those who prefer travel light and don't like to use the vault toilets in the campgrounds. The Green Elephant Pop Up tent falls into the category of "professional camping equipment". 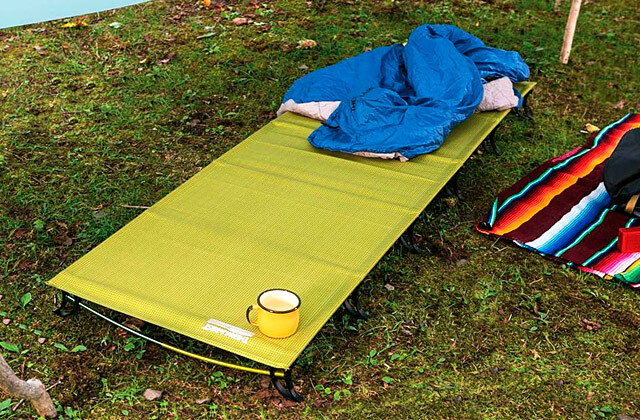 It's durable and sturdy to stand to the test of time and hold to all vigors of your camping trips and weather conditions. Everything about it screams high quality. It's designed with water-repellent polyester, a heavy-duty door zipper, and reliable stitching. For sure, it's the shelter you can count on in any situation. 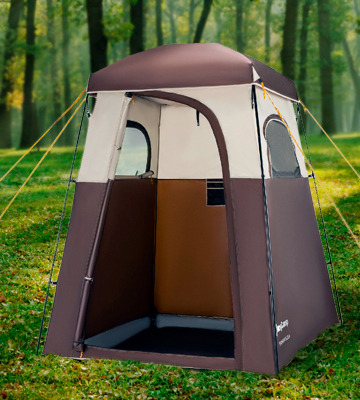 During vacations on the campground, beach or forest, fishing trips or hiking tours, this privacy tent is the perfect solution. 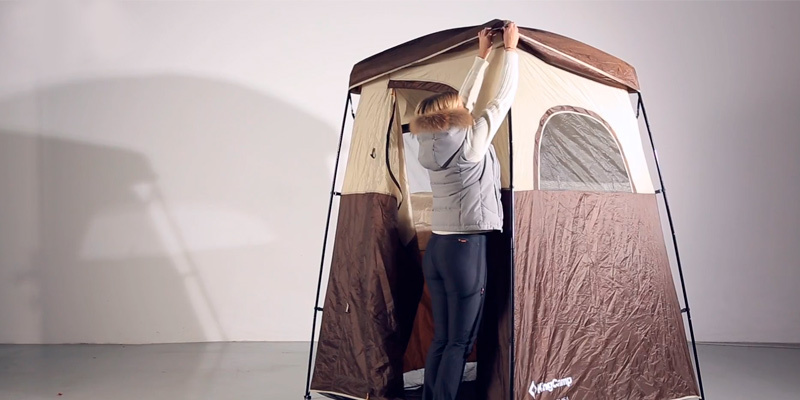 Measuring 6’ 10.7” x 3’ 11” x 3’ 11”, this tent is among the highest models in its category. It offers plenty of head and side room and affords for comfortable movement within. The only thing that might confuse you a bit is its no-floor design. But while some users find this design as pain, we consider it a gain. Floor-less design can help maintain cleanliness after showering or clothes changing. Plus, you're less likely to slip in there. Inside, this multipurpose pop-up tent is jam-packed with multiple accessories for your convenience. To specify, it has a mosquito netting shower opening at the top, a lantern hook, a clothes hanger, storage pouch for personal belongings, and even a special hanger for toilet paper. The package also includes a carry bag and an additional rain cover that can be placed over the netting to keep the tent dry in rain. 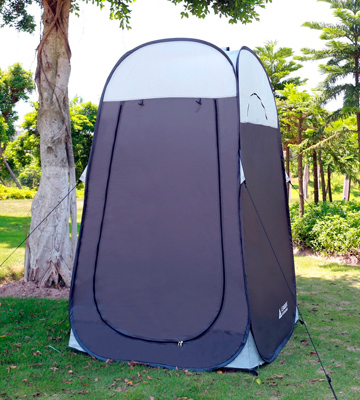 The Leader Accessories Pop Up Tent is the model that can find so many uses, and not only at the campsite. It's versatile enough to be used as a baby tent for playing, a dressing room at apparel trade shows or modeling photo sessions, a changing area near your pool, a bathroom, or a roadside toilet (it's fairly spacious and provides an excellent place for your throne). The tent seems very stoutly-build with reliable zippers and strong stitching. It features a large door with full double zipper for convenient access. The top part also has a zipper and can be opened for maximum ventilation, though bear in mind that there is no netting. We consider this design solution a double sword. On the one hand, mosquitoes and other nasties will be able to penetrate inside. But on the other hand, you can open the roof and enjoy "the natural shower" when it's raining. When showering, you can benefit from a sewn-in mesh pocket that is large enough to hold a full-size bottle of body soap, shampoo, conditioner, a bottle of body scrub, and lotion. There is also a clothesline inside along one of the walls. It's perfect for discarded clothes and towels. It's worth mentioning that the tent has a nylon partial floor. It's kind of useless for a shower and we would recommend you to replace it with a shower mat (not included). But, for changing, a removable partial floor is more than enough. All things considered, this is a nice tent to have in your household. 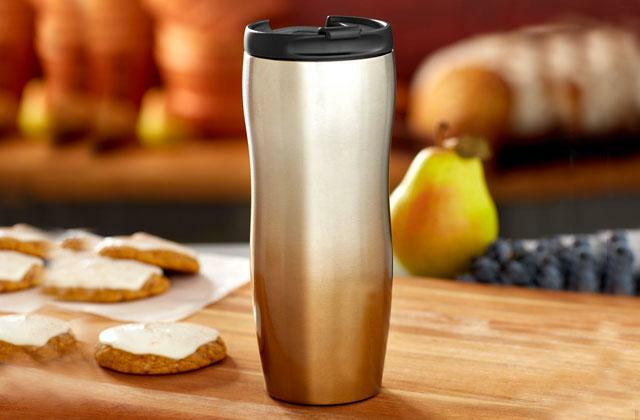 It won't cost you a fortune nor will it take much storage space, but it will come in handy on so many occasions. If you have a passion for adventure and often travel, a shower tent (just like a camping tent) is a must-have thing in your camping arsenal. It's a special enclosure that can provide you with privacy in the wild and extend your camping adventures for a very very long time. A shower tent is incredibly versatile as it affords a private and intimate space for showering, changing clothes, or using the restroom any time and any place. 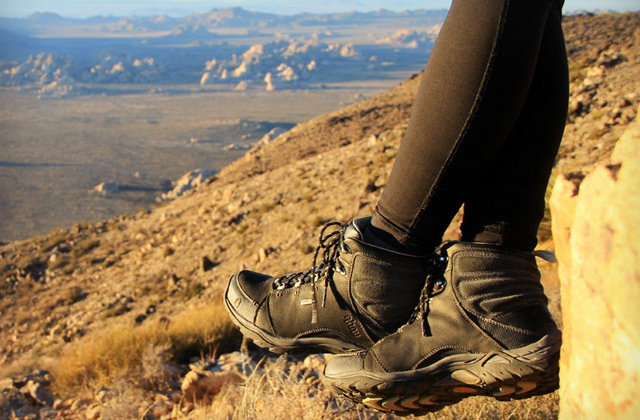 Having one, families with children can go on worry-free camping trips or hiking tours. A privacy shelter is also ideal for use by people within large, collective sleep areas, as well as for actors and models changing clothes between photo sessions. Plus, it can double as a temporary dressing room at clothes vending stands. 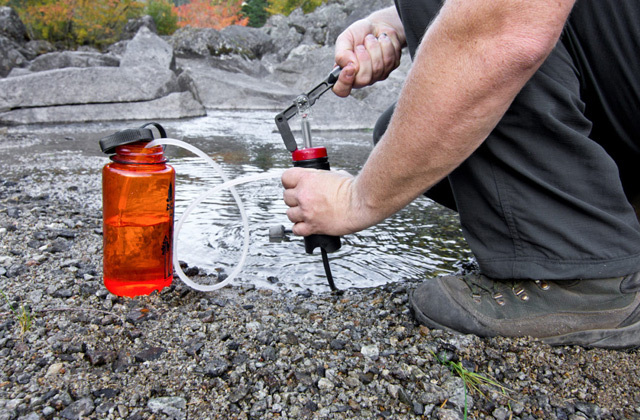 In other words, this product is very functional and can find many uses outside. 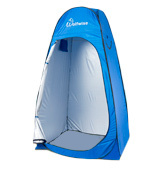 For this review, we have selected top-quality shower tents for any budget and need. Whether your passion for adventures brings you to the beach or the mountains, here you can find perfect a privacy tent for every occasion. Planing a long-distance trip in the near future? 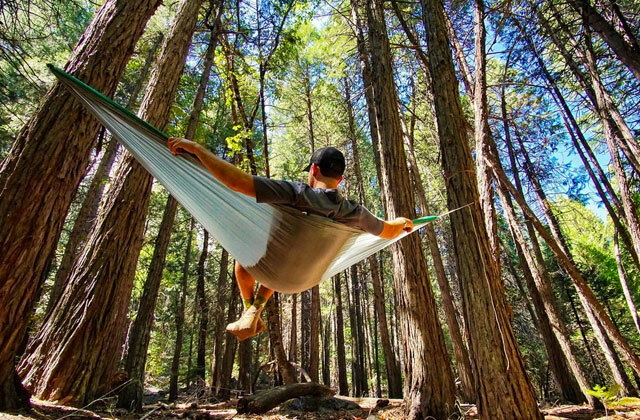 Make sure you've got a camping chair, a camping grill and a hammock as well.